Písac or Pisac (possibly from Quechua for Nothoprocta, also spelled p'isaqa) is a Peruvian village in the Sacred Valley of the Incas. It is situated on the Vilcanota River. Pisac is most known for its Incan ruins and large market every Sunday, Tuesday, and Thursday, an event which attracts heavy tourist traffic from nearby Cusco. Pisac is perhaps best known for its Incan ruins, known as Inca Písac, which lie atop a hill at the entrance to the valley. The ruins are separated along the ridge into four groups: P'isaqa, Inti Watana, Qalla Q'asa, and Kinchiraqay. Inti Watana group includes the Temple of the Sun, baths, altars, water fountains, a ceremonial platform, and an inti watana, a volcanic outcrop carved into a "hitching post for the Sun" (or Inti). The angles of its base suggest that it served to define the changes of the seasons. Qalla Q'asa, which is built onto a natural spur and overlooks the valley, is known as the citadel. With military, religious, and agricultural structures, the site served at least a triple purpose. Researchers believe that Písac defended the southern entrance to the Sacred Valley, while Choquequirao defended the western entrance, and the fortress at Ollantaytambo the northern. Inca Pisac controlled a route which connected the Inca Empire with the border of the rain forest. The sanctuary of Huanca, site of a sacred shrine, is also near the village. Pilgrims travel to the shrine every September. One of its more notable features was a large pisonay tree, which dominated the central plaza (it was destroyed by a 2013 thunderstorm). According to the scholar Kim MacQuarrie, Pachacuti erected a number of royal estates to memorialize victories over other ethnic groups. 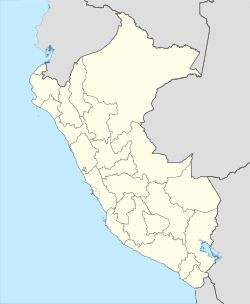 Among these royal estates are Písac (victory over the Cuyos), Ollantaytambo (victory over the Tambos), and Machu Picchu (conquest of the Vilcabamba Valley). Other historians suggest that Písac was established to protect Cusco from possible attacks of the Asháninka nations. It is unknown when Inca Písac was built. Since it does not appear to have been inhabited by any pre-Inca civilization, it was most likely built no earlier than 1440. Francisco Pizarro and the Spanish conquerors destroyed Inca Písac in the early 1530s. The modern town of Písac was built in the valley by Viceroy Toledo during the 1570s. ^ a b "Pisac Market and ruins". Retrieved 2006-03-21. ^ Box, Ben; Alan Murphy (2003-07-01). Footprint Peru Handbook. ISBN 1-903471-51-6. ^ Jenkins, Dilwyn (2003-10-06). The Rough Guide to Peru. Rough Guides. ISBN 1-84353-074-0. ^ Readers Digest: "Mysteries of the Ancient Americas: The New World before Columbus"
^ MacQuarrie, Kim (2007-06-17). The last Days of the Incas. Simon & Schuster. ISBN 978-0-7432-6049-7. Wikimedia Commons has media related to Pisac. Wikivoyage has a travel guide for Pisac.